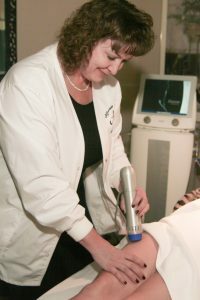 Non Invasive Body Shaping without pain or downtime? Permanent fat reduction as well as skin tightening? The Vanquish ME is an award winning device that kills fat cells in 6 treatments. This multi-polar Radio Frequency device can reduce fat on the abdomen, flanks, “bra fat”, thighs and inner knees. FDA approved for circumferential fat reduction of the abdomen and thighs. Included in your series of 6 treatments is the ZWave treatment to increase blood flow to the treatment area, allowing the body to remove the damaged fat cells, this allows for better and faster overall results of fat reduction. Like the Vanquish ME, this is also a pain free treatment. Z wave is a non-surgical, FDA cleared treatment that uses acoustic waves to reduce the appearance of cellulite. The Z Wave is also automatically done after your Vanquish ME permanent fat reduction treatments. Z Wave is radial pulse technology that is a pain free treatment that is also a stand alone treatment for the temporary improvement of cellulite.